If you have very limited time to explicitly teach (or learn) academic vocabulary, concentrate on the essentials: the language of instructions and test prompts. Students probably have at least a vague idea of the meaning of words like describe, demonstrate, identify, and analyze, but the more clearly they understand them, the better they will do on tests, writing assignments, and even reading comprehension, in school, college, and the professional world. Vocabulary.com has an excellent article on the need to learn test prompt vocabulary. They quote Jim Burke, who points out "You cannot expect to succeed on assignments if you do not understand the directions." They also have exercises to help students practice Burke’s 358 recommended words. For the last year or so I have been pondering ways to help students understand those and other very useful academic words—for those unwilling or unable to practice extensively on Vocabulary.com. I finally put together a pdf with lesson plans that teach and give explicit practice with just over 35 words- Burke’s 15, 10 others he uses to help explain them, and a few other very frequently used words from Coxhead’s Academic Word List. 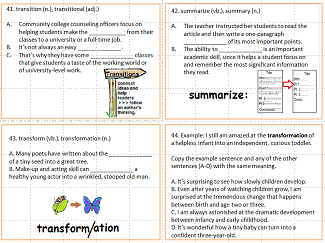 The words are introduced using fairly simple articles that discuss and demonstrate essay writing. Students can practice them with task cards and a crossword puzzle, as well as reading them again in later articles, including one that asks them to choose the best transition words and another that has them proofread an essay. It also is a fairly simple introduction to English essay writing and proof-reading for ELLs, giving examples of comparative and cause and effect essays (as well as a hybrid comparative/persuasive essay) and links to others, as well as ideas for one they can write. I’m proud enough of it that I just had to share it here. You can download it at Vocabulary Worksheets for an introductory price of $6.50. If you do try it, please let me know what you think, and any criticisms or suggestions. Here’s another page with some great ideas for teaching vocabulary from elt-connect.